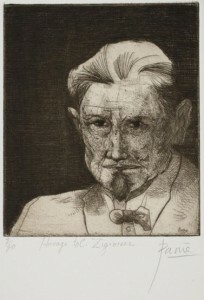 In 1941 Carl Zigrosser was appointed as the first Curator of Prints, Drawings and Rare Books at the Philadelphia Museum of Art, a position he held until 1963. Under Zigrosser’s direction, the collection grew dramatically and came to include a number of important gifts ranging from a group of Watteau engravings from Lessing J. Rosenwald to Alfred Stieglitz’ collection of photographs. Zigrosser had a long and close relationship with The Print Center, serving as a Board member, speaking regularly, jurying exhibitions and building The Print Club Permanent Collection at the Philadelphia Museum of Art. Since his tenure, a curator from the museum’s Department of Prints, Drawings & Photographs has regularly served on the Board of Governors.